Northern TRIBS Swimming, Inc. - About Us! Northern TRIBS Swimming is a club member of the Adirondack LSC in the﻿ Eastern Zone of USA Swimming. We are dedicated to enhancing technique and race ability for motivated swimmers in the communities surrounding the north flowing tributaries (tribs) of the St. Lawrence River in Northern New York. The majestic St. Lawrence River is fueled by its northern tribs just as every member of Northern TRIBS Swimming makes our club stronger. Our mission is to provide opportunities for swimmers to achieve their highest potential, both as a person and an athlete, while promoting and encourages the highest degree of understanding and respect towards teammates, competitors, supporters, and the waters we swim in. Our vision is to inspire and enable our members to achieve excellence in the sport of swimming and in life. Did you know that we are Thee American Eels or why the American Eel was chosen as our mascot? How about, what does TRIBS stand for? Please read our Complete Mission Statement to learn why the club was founded and how things developed from the beginning. Coach Joshua Jock has been with Northern TRIBS Swimming since the beginning. Josh paved the way for NTS to become a not-for-profit Corporation and is now the President of the Board for Northern TRIBS Swimming, Inc. Josh has also been the Asst. Swim Coach at SUNY Potsdam (2009 - 2012). While at Potsdam Josh instructed the Bears Swim Club's Competitive Swim Program, directed the Potsdam Swim Camp, acted as the Summer Camps Aquatic Director, and directed the SUNY Potsdam Triathlon. In the past, Josh has coached HS swimming (2 years), officiated HS and collegiate swimming (3 years), and also competed in Masters Swimming (since 2008). Josh swam during his college years (1998 - 2003) while earning a BA in Theatre Arts and a MST in Elementary Education from SUNY Potsdam. After graduating, Josh traveled with several theatre companies across the States ending up in California for 1 year teaching Stagecraft and Production at a University. In the fall of 2005 he returned to N.Y. to teach Kindergarten. Since co-founding TRIBS in 2007, Josh has built the lesson and stroke school program we use today. 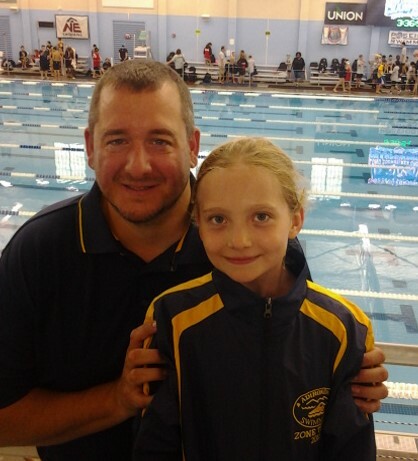 As the head coach, Josh has coached many of the club swimmers to the Adirondack District Championships, of which five of his swimmers went on to participate in the Eastern Zone Championships. Josh has also been a Long Course and Chort Course Age Group Zones Coach (2015 & 2016) and he has led TRIBS to becoming recognized as a Level 2 Club by USA Swimming in part of the Club Recognition Program. SEE HOW MUCH WE'VE GROWN!